Gonabadi dervishes lawyer, Mostafa Daneshjou was hospitalized after his health condition become worse and critical. According to Majzouban (Gonabadi Dervishes news site), Gonabadi Dervishes’ lawyer Mostafa Daneshjoo, who has been incarcerated for more than six months in Ward 350 of Evin prison, was hospitalized with severe asthma attacks and respiratory problems. He also had been suffering from kidney problems in the past few weeks. Mostafa Daneshjoo has been hospitalized under tight security with hands and feet cuffed to the bed. The security agents have not allowed his family to see him nor would they allow them to follow up on his status. On May 18, 2011, Gonabadi Dervishes lawyer, Mostafa Daneshjoo was sentenced to 7 months in prison by the Appeals Court in Mazandaran province on charges of publishing lies and disturbing public opinion and was sent to Sari prison. On October 29, 2011 and after completing his prison term in Sari, Daneshjoo was transferred to Evin prison’s high security Ward in Tehran. Currently, Daneshjoo’s health has been reported satisfactory. Female political prisoners in Evin prison are suffering from illness and are in poor health. According to the families of political prisoners who met on Monday with women prisoners, during the last week most were sick and proper medical care was not provided to them. The female political prisoners said they “Suffer from various illnesses, kidney problems, headaches, colds, high blood pressure, heart palpitation and……are among the problems they constantly suffer from . They also said that the store in the women’s ward has stopped carrying fruits, meat and other important food items. The prisoners said, “The store’s excuse for not carrying these items is that orders placed for these items are low and they can not carry such low amounts”. It now has been two months that the female political prisoners have been deprived of fruits and vegetables. On Monday, prison official disallowed the families to give personal hygiene items like shampoo and tooth brush to the prisoners. Talking about the problems in the women’s Ward, the families say, “The women are practically deprived of fresh air area. There is a very small courtyard that the women use to hang their clothes to dry. At times, the store in this Ward will not carry any meat, fruits or chicken for months while these are part of main food items. The families of these political prisoners say, “We try not publicizing these problems and try to solve them by speaking with the authorities. But, day-by-day, these prisoners face more problems and their situation becomes worse. 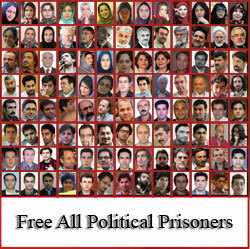 Currently there are 26 female political prisoners in Evin most of whom were arrested post-2009 presidential election. Doctors in Evin have warned of the dire and deteriorating health condition of Hossein Ronaghi Malki in the wake of his refusal to go under another kidney surgery. According to reports by Kalameh, human rights activist, blogger Sayed Hossein Ronaghi Maleki who was sentenced to 15 years in prison in Branch 26 of the Revolutionary Court, suffered kidney damage due to torture by the interrogators. Ronaghi is now refusing any treatment or new surgery due to the continued interference by IRGC (Sepah) and the interrogators in his case. This incarcerated blogger has already gone under four operations at Hasheminejad hospital, but each time was returned to prison during recovery time and before treatment was complete. This caused his kidney operations to be unsuccessful and he again suffered bleeding and infection. The refusal of this political prisoner to under go another kidney operations has intensified his deteriorating health condition to the point that the doctors and specialists at Evin clinic have warned prison officials that Hossein is on the verge of loosing his kidney functionality and would have to be put under dialyses if he is not operated on soon. Hossein and his family have protested many times and have filed complaint with the Judiciary about the interference by the intelligence entities in his case and the refusal of Sepah (IRGC) in allowing his medical furlough to be granted, but have yet to received an answer from the Judiciary. On Saturday April 21 literary translator and IT specialist Mohamad Soleimaninia on his day 17 of hunger strike was transferred from Intelligence Ministry’s Ward 209 to General Public Ward 305 in Evin prison. He continues to be on hunger strike. Political prisoner Mohamad Soleimaninia launched a hunger strike on April 2 protesting his illegal arrest, his limbo status and harsh treatment and torture by interrogators. Soleimaninia was arrested on January 10, 2012 on charges of developing illegal social networking websites and with cooperation with enemy states. At the time of arrest he managed a number of social networking Internet sites. This IT specialist and literary translator has been incarcerated without formally being charged. He was placed in solitary confinement for days. During his interrogations, he suffered harsh treatment, severe beatings and was threatened many times by the interrogators. During interrogation period and while in solitary confinement, he was deprived of time outside of his cell, deprived of visit and phone calls, all for the purpose of obtaining false confession from him. Seventeen Gonabadi Dervishes have been formally charged with Moharebeh (Translator’s note: Enmity against God. This charge can carry the death penalty), corruption agents on earth and carrying of illegal firearms. According to reports by Majzooban Noor site (Gonabadi Dervishes news site), last March, court was held in city of Kovar for seventeen Gonabadi Dervishes in Branch 101 of the Criminal Court presided by Judge Hemati. Per this report, Kazem Dehghan, Hamidreza Aarayesh, Mohamad Ali Dehghan, Amir Hamzeh Dehghan, Mohsen Esmaeili, Abonaz Malekpour, Behyar Rajabi, Sayd Ebrahim Bahrami, Mohamad Ali Shamshirzan and Mohamad Ali Sadeghi were all charged with Moharebeh, corruption agents on earth and carry of illegal firearms. Gholamali Birmi, Omid Ali Akbaritabar, Mehrdad Keshavarz, Mohamad Aarayesh, Abdolreza Aarayesh, Manouchehr Zaree and Aman Cheraghi were all charged with carrying of illegal firearms. The Judge hearing these cases ruled the scope of these charges are beyond the authority of his court’s jurisdiction and referred the case to the Revolutionary Court in Shiraz. It should be noted that, from last September, pressure and attack on the Kovar city dervishes increased day by day, leading to the night attacks by the Para-Militant and the Plainclothes forces on the homes and businesses of dervishes. During these altercations, tens of dervishes were arrested and injured and one was killed by excessive bleeding from a gunshot wound. In continuation of these events, in the past seven months, the dervishes residing in Kovar city have lost their peace and comfort by violent raids of their homes by the security forces for the purpose of arresting the dervishes. More than twenty dervishes have been arrested during this period that finally led to the false accusations and heavy charges for the dervishes. Singer of protest and pro human rights songs, Amir Ehsan Tehrani Sekhavat is serving time in Ward 350 of Evin prison. He was charged and convicted of membership in a human rights organization and generating propaganda against the establishment. According to reports by Kalameh, Amir Ehsan, who at the time of arrest was the director of the Cultural Committee of the Human Rights Activists Group in Iran, was arrested on March 8, 2010 during the mass arrests of the human rights activists in Iran by IRGC’s intelligence forces. He was incarcerated in IRGC’s Ward 240 solitary confinement for two weeks. This human rights activist was the manager for the underground band “Azadi”. He performed protest and pro human rights songs under the alias Arya. At the time of arrest, he was an agricultural major at Rodehen university. During interrogations, Amir Ehsan was under extreme pressure and suffered beatings by the interrogators for the purpose of obtaining false confessions against himself and others. On April 8, 2011, in Branch 26 of the Revolutionary Court, Amir Ehsan Tehrani was tried and sentenced to one year in prison by Judge Pirabbasi, on the charges of propagandizing against the Islamic Republic, and for membership in the illegal group, the Human Rights Activists Group in Iran. He is currently serving his prison term in Ward 350 of Evin prison. Political prisoner Ehsan Houshmand is under intense pressure to give a false confession to match the interrogator’s scenario. Per reports by the National-Religious site, this independent researcher who holds a nationalistic position on ethnic issues in Iran, has been arrested twice in the past year. In the few visits this National-Religious activist has had with his family, they are much concerned by the condition of his health. Houshmand, a senior sociology expert, has been incarcerated since January 7, 2012 under intense pressure by the interrogators to make a false confession. So far, many different political movements have asked for the release of this researcher. Political prisoner Hamid Ghasemi-Shall received the news of his sister’s sudden death simultaneously with the news of his death sentence having been sent to the enforcement division. Mr. Khodabakhsh, the assistant prosecutor at Evin prison’s sentence enforcement division, confirmed that the death sentence of Hamid Ghasemi-Shall who has been incarcerated for four years, has been received by the enforcement division. Hamid Ghasemi-Shall is accused receiving Canadian political asylum by being a supporter of the Mojahedin Khalgh Organization (MEK/MKO), and soliciting information via email from his high ranked naval officer eldest brother. The evidence used in issuing the death penalty for Hamid and his brother who died in prison after he received the death penalty, were emails that the Justice Ministry’s experts called fake and fabricated. But the court, ignoring the testimony of the Justice Ministry’s experts, issued the death penalty based on the testimony of the military’s intelligence officers. Hamid’s brother, Alborz Ghasemi, a prominent naval officer was trusted by Rear Admiral Sayari who is the author of more than twenty books in technical and military fields that are used in teaching the military’s naval division and Sepha’s (IRGC) officers. To no avail, the Commander of the Fourth Naval Station, Rear Admiral Sayari tried to help in clearing up the misunderstandings in Alborz’s case. The evidence of guilt in Ghasemi brothers’ case was based on fake and fabricated emails and confessions obtained under torture from Alborz Ghasemi, was disregarded by the presiding Judge at Branch 29 of the Revolutionary Court, despite the fact that the emails in question were removed as evidence from the case due to technical flaws and their invalidity. Hamid Ghasemi’s obtaining political asylum through voicing support for, and membership in, the Mojahedin Khalgh Organization was the pretext used in issuing the death sentence on Moharebeh charges (enmity against God) for the Ghasemi brothers. A membership that was never true and was only used by Hamid to accelerate obtaining an asylum visa. Legally, due to doubts in the validity of the evidence (the emails) the maximum penalty should have not been issued in this case. Also, per jurisprudence decree by religious leaders, including Ayatollah Khamenei, seeking political asylum is not considered enmity against God. And most importantly according to lawyers, the removal of Article 186 from the new Islamic Penal Code which has already been approved, requires re-examining and review of the case of Ghasemi brothers. The announcement made by the Sentence Enforcement Division that Hamid Ghasemi’s sentence may be carried out at anytime, comes despite the promise made last summer by Jafari-dowlatabadi (Tehran’s Public Prosecutor) while meeting with families of political prisoners, that this sentence will not be implemented. Furthermore, after review of Hamid Ghasemi’s case file by presiding judge of Branch 31 of the Supreme Court, he confirmed that Hamid Ghasemi had not committed any crime. However, since he can not officially review the case and change the ruling, but per article 18 the defendant can prevent the enforcement of the sentence and request an appeal. The news of the possible execution of Hamid Ghasemi, along with the news of his sister’s death, has brought an air of sadness to Ward 350’s prisoners. Issuing an order to carry out this sentence comes as the judicial and the intelligence system know very well the charges against this person are false and he is innocent. But as in past years, in sacrificing of this person, they yet again serve the Mojahedin Khalgh Organization. As Mir Hossein Mousavi had warned in his statement number seventeen, do not revive a dead cult for your own political and factional gains. Hamid Ghasemi-Shal was arrested May 24, 2008 on charges of espionage and contact with Mojahedin Khalgh Organization (MKO/MEK). He was sentenced to death based on those charges. His sister says the sentence has been sent to the Enforcement Division and can be enforced at anytime. Mrs. Ghasemi describes how her brother was arrested and what her family has endured since his arrest. She also talks about all the efforts made by the family to stop Hamid’s execution. She points out that, “When the Public Prosecutor Mr. Jafari-Dowlatabadi first was appointed to his job, to make himself look good he tried to be helpful, and we were able to visit with him a few times. But now days he seems to be out of reach and we are not able to see him any more”. In response to the question of what was Hamid’s reaction to the news of his sentence having been sent to the Enforcement Division, Mrs. Ghasemi said, “On the day I visited him he was in shock and broke down. On the one hand, I gave him the news of our sister’s death, and on the other hand they informed him of his death sentence. My mother was also present during this visit. You can just imagine what my mother felt like that day. She had recently lost her 40 year old daughter and then there, right in front of her, they gave the news of her son’s death sentence to him.